Jen and Duncan had three children under the age of 10. Their middle daughter, Charlotte, was a bright 8 year old, but seemed to be underachieving at school. Although her test results were high, her class work was often incomplete and Charlotte seemed to have difficulty undertaking independent project work and homework tasks. She spent hours planning and thinking about her work, but little was accomplished. When working at home or at school, Charlotte constantly ripped pages from her book and started again. Many homework sessions ended in tears and Charlotte was convinced that she was unable to complete school work at a level that would please either her teacher or herself. With self-esteem and confidence issues emerging, Jen and Duncan sought assistance in helping Charlotte overcome or cope with the obvious perfectionism that was holding her back. 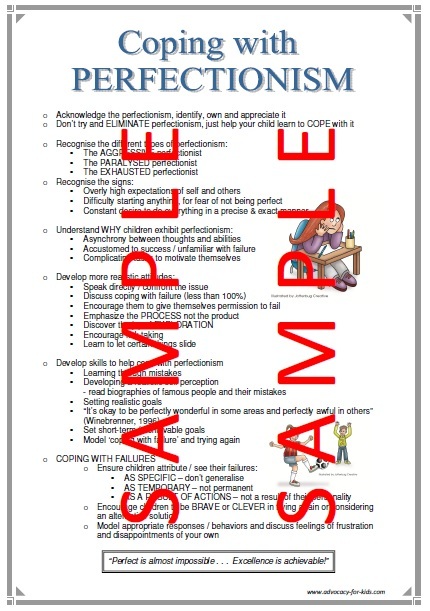 MOTIVATIONAL POSTER - "Parenting Tips - Coping with Perfectionism"